Very nice idea. I love the sacrificial aspects of every religion. Also nice clothing, those golden piercing must have hurt ! One question, in what aspect is Au the sun god? how does it effect their religion? Do they have sun temple and etc? In the same way both relgions belive Nauceanica the Watergodess is the planet this group belives Au is the red dwarf sun itself. Yes they have a sun temple in which they use when both suns like up becuase the red sun is in front of the blue sun when they line up. Thus the sky turns red durring this time. i wonder, is there any terrorism in the Naucean civilization say in the modern times? Why Naucean and other creatures of its planet have two pairs of eyes? Loving the Desert Tribe info' (just what I asked for ). I never expected them to be this exciting though. Can't wait to hear a little more about them. So do they get wiped out before the Robotic Age? I hope not. I want to know the function, just this. Simply curiosity. They evolved that way very early on. Thus most creatures on the planet have 4 eyes, 4 legs, bilateral and a majority have a beak, 2nd mouth oevr the beak and even 6 tentiles on either side of the beak. Ok, ok, but is it in order to have an improved vision? cause their sun is weak and they can't get all the light they need to see? a pair of eyes are normal and the other are for infrared? just because they look cool? they have eyes but they are really blind? ...? This is what i mean. Or maybe "there's no explanation". The larger back pair see as we do in R,O,Y,G, B, I, V while the smaller front eyes see in only infrared. Also Plz do not double post. Plz detle the 2nd one and add to the first one. EDIT: The Cave tribe are blind in their main eyes and see in the darkness with their infrared eyes. 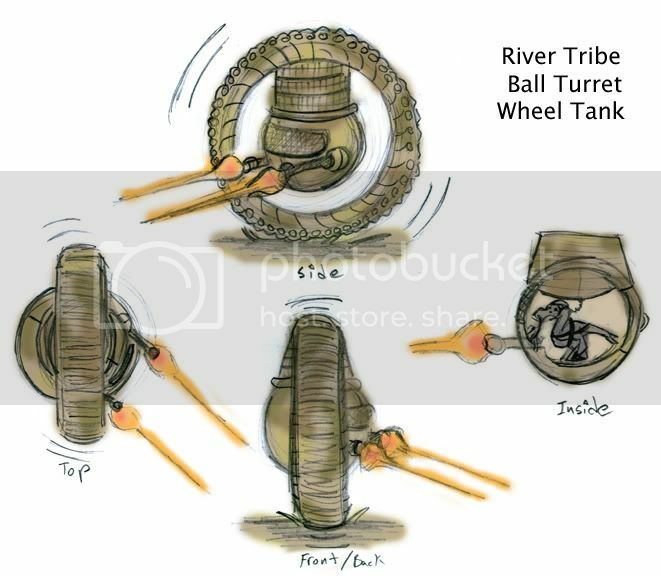 Here is a River Tribe Ball Turret Wheel Tank used during the Atomic War. These were painted with desert cammo so when not moving it could hide from the Desert Tribe. These wheel could move over sand dunes with eases and reverse direction quickly. Like a Earth wheel bike the outside wheel spins while the internal wheel stays stable. This movement works like a gyro scope. Inside is a ball turret similar to the ball gun turrets used on the bottom of World War II air craft. These can turn 360 degrees around as well and rotative up and down and diagonal. The only way it cannot move is completly over the top because of the guns. Gunner of these were very accurate and it had a fail safe system in which if the gun was behind the wheel it would not fire. Once it cleared it it could continue.The cockpit holds 2 Nauceans side by side one looks out the window and shoots while the pilot reads the controls with a primitive view screen. This was the first use of any sort of screen since televesion was not invented yet. The displace showed a black and white image from 4 cameras that were positions on either side of the conical coll um that held the sphere in place. This part never moved thus 2 faced forward and 2 backwards once they were traveling in reverse. If the wheel fell over to one side to the other for any reason hydrolic lifts on the wheel part will pop it back up. The Wheel tank was not only very fast and could go on any terrain but was actually well armored. everything from the treads to the ball turret its self was heavily armored. Since they did not have brakes they had to use reverse to get it to a stop. The plots of these were called "Blind Tornados" because of all the sand it kicked up and how most had to use their other instruments rather than the cameras to even know where they were going. I used 3D Studio Max. where can i get that is that downloadable? No but you can get g-max. Which is the free lite version of 3D studio max. Basically you can make the same stuff without the ability to record animations. But you can still make pictures like i did. Plz don't ask me to teach you how to use it :p There are tutorials on how to use it if you just goggle it. Page created in 0.094 seconds with 25 queries.